Since it was built about 50 years ago, Interstate 35 has been an enormous physical and psychological barrier through downtown Austin. Partly elevated, partly sunk, it’s the dividing line between what locals refer to as “east Austin” and plain old Austin. It’s also a major NAFTA trade corridor that carries 250,000 vehicles a day, and is considered one of the most congested freeways in the country. I-35 is due for repair, and naturally TxDOT has proposed a traditional rebuilding and widening project. But an alternative proposal has emerged from the community calling for something radically different. In Austin, the proposal is known as “cut and cap,” and it would help bridge the divide without removing the freeway. The idea is to bury or “cut” the highway and “cap” it with an at-grade boulevard and mixed-use development. 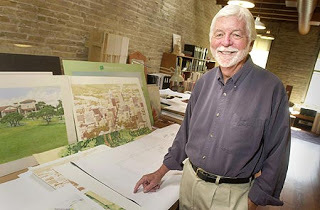 The $550 million concept is the brainchild of Austin architect Sinclair Black. The plan would open up some 30 acres of valuable downtown land for walkable, mixed-use development, Black says. An analysis by his planning and architecture firm, Black + Vernooy, found that if the site were developed relatively intensively, it could support some $3.2 billion in development. About 7,000 people could live within the current right of way, he says, and it could accommodate some 2 million square feet of retail and restaurants. That development could return enough tax revenue to cover the costs of the project, he says. Because the freeway is so widely used, tearing it down just didn’t seem practical, Black said. The plan is partly inspired by a similar project in Dallas that capped the Woodall Rodgers Freeway. Now above the highway people play chess and ping-pong at the Klyde Warren Park, which opened last year. There are many other precedents, said Black, like Millennium Park in Chicago, which sits on top of rail yards. Black and his group, Reconnect Austin, have drawn together a coalition for the project, including environmental groups like the Sierra Club and a major development firm called Rida. It’s a big tent that has “never, never” occurred until now, Black said. 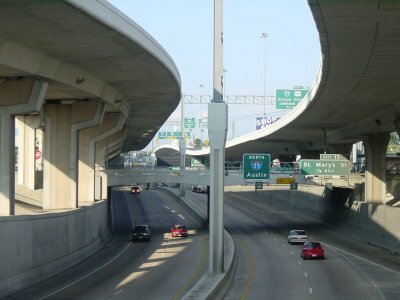 Last month, the Austin City Council signaled its support, passing a resolution asking TxDOT to consider the cut-and-cap project along with a range of other options. TxDOT, to its credit, has agreed to consider it alongside three other traditional alternatives it has put forward. Black still thinks TxDOT doesn’t want to cap the highway. So, the Big Dig, but in Texas. With such a large road underneath, does the top road need six lanes for automobiles? Advice… learn from Boston. Not only from the Big Dig, but from the projects – successful and failed – capping the Mass Turnpike. Air rights sounds great, but relative to an adjacent piece of un- or under-developed land, it has negative value. The minimum clear spans shown in that rendering above are 70′, conservatively… that drives foundation and structural costs way up. Agreed. No matter how much you want it to be and play up the idea, it is very difficult to make a vibrant, walkable, mixed-use urban space based around a 6-lane street with wide center median. The top street should be 4 lanes maximum and it should be designed for max speeds of 30 mph with curb parking. It can have a median, but not more than 10-15 feet wide. 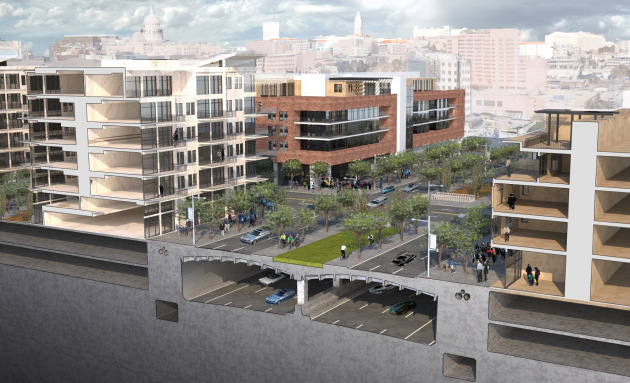 The idea here is good … but, in reality, what is being shown is still a two-level highway. I understand that Mr. Black likely understands these things and is trying to make something palateable to DOT so as not to completely scare them off, but if you’re going to propose something, sometimes it might be worth just going out there and proposing what is really needed. Ask that to Chicago (Wacker Drive). The top street should just be a linear park with bike paths and walkways. But the Bigger Dig because it’s Texas. There are street lights at every intersection to limit traffic speed. This isn’t so much about putting a park above a freeway as it is about continuing the downtown grid into East Austin so as to eliminate the existing disconnect. That double decked freeway picture is actually in downtown San Antonio. No, it is in Austin but just north of downtown. Its NOT the area they area talking about redeloping but the north end would meet with this area that has elevated “express” lanes. The transition between this two similar areas would be critical. I anticipate it would require the elevated express to the buried section and not allow exit or entrance ramps for about a 5 mile stretch of I-35. I love the concept but this transition and the bridge over Lady Bird Lake to the south are critical. If they become choke points and cars just sit underground and travel at the same pace then it will not solve the primary traffic problem on 1-35. There’s no St. Mary’s Street exit in Austin and it doesn’t look familiar either. Must be San Antonio, just like Coddat said. Yeah that is san Antonio. Not Austin I travel between both all the time. Its sunken part of 35 right by downtown near San pedro. How could a city that needs updated roads keep changing there minds in the middle of projects unless there were not corruption higher up. Throw the bums out & let them panhandle with the other 10,000 Austin wierdites. Now THAT is what I would call a “complete street”- totally urban with that lower level.